Automating your payment processes to manage declined credit cards, payment collections, subscriptions plans and abandoned shopping carts will save you time and help recapture and prevent lost revenue online. Ecommerce is growing 23% annually, as more businesses realize how cost-effective and simple selling online can be. However, for some businesses, there are still gray areas associated with taking payments online: for example, the actually getting paid part. Ecommerce can go from smooth and efficient to messy and complicated very quickly when an online shopping cart is abandoned or a transaction is interrupted — like a credit card being declined. And incomplete or failed transactions are more common than might be expected. Over 75% of online orders are abandoned and, on average, 5-10% of credit card transactions are declined. That declined percentage goes up to 25-30% when it’s a recurring or subscription charge. Imagine you have $5,000 of recurring monthly revenue. Keeping in mind the average credit card decline rate, you can estimate $1,250 of that revenue has the potential to get declined. That brings your net monthly revenue down to $3,750, which is a large dent in your bottom line. To combat this, ecommerce platforms like ONTRAPORT have built-in features and functionality that allow you to automatically manage declined credit cards, payment collections, subscription plans and abandoned shopping carts to help you recapture and prevent that loss of revenue. Because declined credit cards for payment plans or subscription products are a very common occurrence, having to deal with each one manually is realistically out of the question. Rather than chasing down people whose payments failed, you can streamline your follow-up with them through automation. This will not only save you time, but it will allow you to collect revenue for payments that would otherwise go unpaid. In ONTRAPORT, you can automate your credit card decline process through Recharge Settings which allow you to manage when and how often attempts will be made to rerun a declined customer’s card. You can specify (in days) how often you would like to attempt recharging a card for a previously failed transaction. For example, you could specify that you want ONTRAPORT to retry your client’s credit cards every three days for a total of 90 days. Then at the end of this recharge cycle, the item’s payment status would automatically be changed to “Write Off” in accordance with standard accounting principles. Within that 90-day recharge period, you could further automate your correspondence reminding the customers to update their card information through emails, SMS messages, or even Task prompts to give them a phone call — all triggered from the moment their credit card is declined. If that 90-day recharge period passes without any action on your clients’ part to update their credit card information, you can also automate the process of removing their access to your product. If you have a WordPress membership site, you can use ONTRAPORT to automatically assign or remove access to certain levels of your site or your site as a whole. Set the lockout triggers for whatever time frame fits your business model, whether that is right when your customers’ payment declines the first time or at the end of your recharge period. To add a pre-built subscription expiration campaign to your ONTRAPORT account now, search “Membership Site: Remove Access When Subscription Is Declined” in the Marketplace. As a rule of thumb, it’s easier to capture funds while your customer is still a customer, rather than after the fact. So using automation to prevent declined payments for the cards that you know are about to expire can save you a lot of potential lost revenue and increase your customer retention. On a simple expired card prevention campaign, your customers can be pulled onto a campaign 30 days before their credit card is set to expire. Through a series of automated emails, SMS messages or whatever type of correspondence you choose, your customers will receive notification before their cards expire. This will give them plenty of notice and allow them to update their card information before it becomes a problem. WordPress PilotPress Customer Center: If you have integrated your WordPress site with ONTRAPORT’s PilotPress Plugin, it’s very easy for your customers to update their credit card information via the Customer Center. 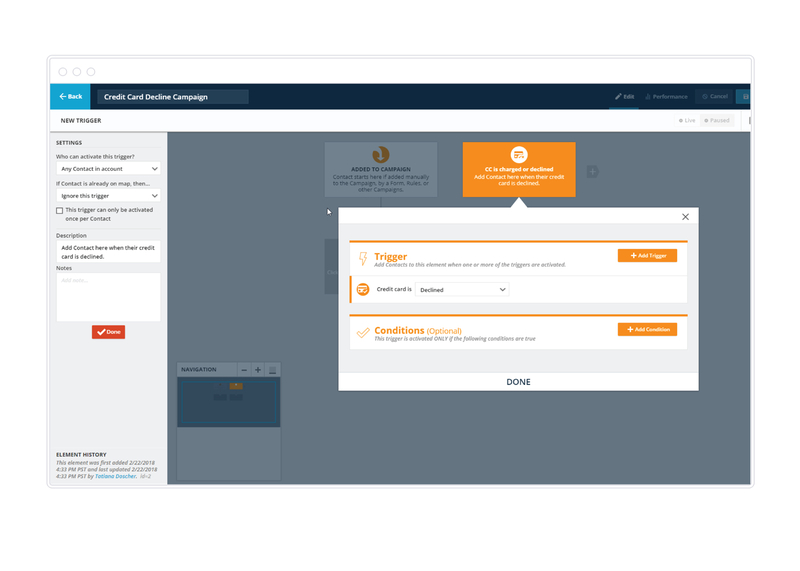 You can add an email step to your expired card prevention campaign that merges their Customer Center login information and a URL to the login page, and they can update their information in one step. Order Form: Depending on what payment gateway you have integrated with ONTRAPORT, you can send your customers a “$0 transaction” order form to update their credit card information. You would simply create an order form with a $0 product named “Credit Authorization” and email out the link as a step in your expired card prevention campaign. Your customers will be able to see that there will be no charge on the card, so there will be little resistance to filling it out. Manually: If your customer has multiple credit cards on file, you can manually change the credit card that is going to be charged. Simply visit their individual contact record and go to the Purchases tab. Then you can select any active card that is associated with the account. Using ONTRAPORT, if at any point you charge a customer in error or you wish to refund them, you can do so directly from their contact record. On the purchases tab within the Transactions section, you can easily find the transaction in question and click on “Refund Transaction.” This will refund that transaction through the original payment gateway. 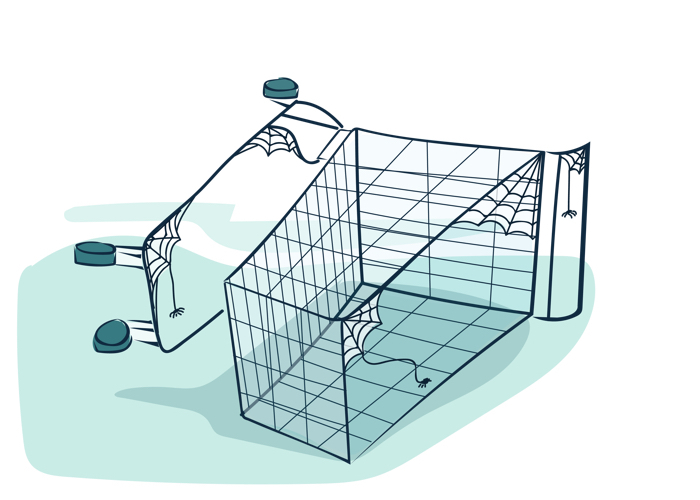 On average, 77% of online shopping carts are abandoned. This means that 77% of customers fail to go through with their purchase once they land on your order page. This could be due to doubt, indecision, hidden costs, a slow website, distractions or a litany of other things. Regardless of the reason, assuming that they will return to your order page and complete the purchase on their own accord is a dangerous gamble. Most of those visitors are not going to return — that is unless you remind them to. A cart abandonment campaign is a highly effective tactic that could help you recover up to 29% of those lost sales. Those who visit your order page are some of the hottest leads you have, so following up with them and urging them to buy could mean a significant revenue increase for you. In ONTRAPORT, you can easily monitor your prospects’ activity on your order pages. Through automation, if you have contacts who visit your order page but don’t purchase, they will be triggered onto your cart abandonment campaign. From there, you can employ multiple tactics to nudge them towards a purchase, such as a series of automated emails that remind them that their product is still waiting for them. Within those emails, you could also offer a personalized coupon code to make the buying decision easier or a downsell to a less expensive product. If you have a product that is at a high price point, you could try to sway them towards a purchase by offering a payment plan as opposed to paying in full. Setting up a payment plan is easy in ONTRAPORT, as you can add multiple payment options to each product right on your order form. To load a pre-built cart abandonment campaign in your ONTRAPORT account today, search “Simple Abandoned Cart Follow Up” in the Campaign Marketplace.